I will have to admit one thing to start with - I don't know how to make Kimchi. I guess you that are reading this right now, quite rightly, wondering what the heck I'm on about? Writing that I don't know how to make Kimchi in a post about making Kimchi?!? What I mean is that I don't have any real knowledge about how you are supposed to make Kimchi, all I can relate to is some different versions of it that I have tasted over the years. Having said that though, there is no one way of making Kimchi. I've read a large number of books with recipes and I've watched quite a few episodes of cookery shows and they are all in agreement - Kimchi is individual and you can freestyle the ingredients quite wildly too. What follows below is how I made it, this time, and to me it tasted quite all right. Next time I'll probably adjust it to see what happens but as first attempts go, I'm more than happy. Actually, I might have started this in the wrong way. 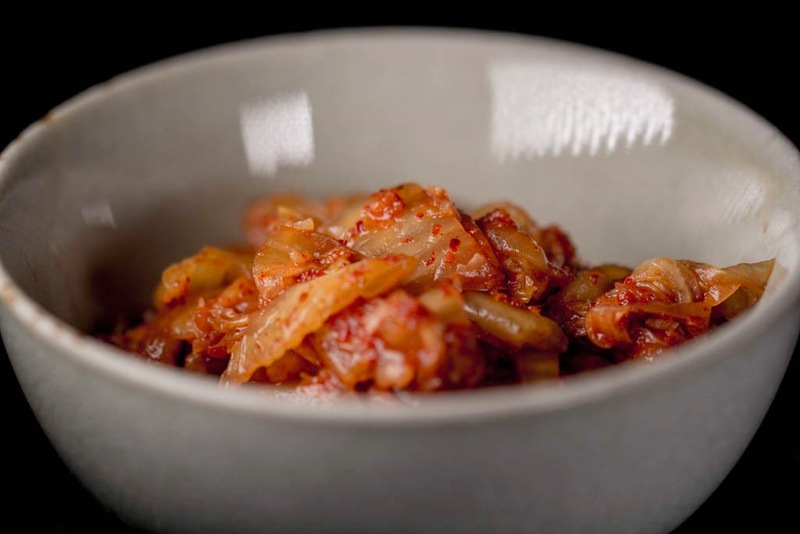 For those of you who don't know what Kimchi is - it is a fermented cabbage dish that originates from Korea. It is really versatile, you can have it as a 'side', on top of your burger or why not in an omelette. If you google it a bit you'll find numerous ways of making and using Kimchi. Give it a go - who knows, you might like it! Quarter the cabbages, removing the tough 'heel', and slice into 1cm wide strips. Put the slices into a bowl and toss well with the salt. Cover the bowl and leave at room temperature for at least four hours. You want the cabbage to release its water and soften quite a bit. Drain the cabbage and rinse well with water to wash away the salt. Drain well. Mix together the Gochugaru, water, soy sauce and Worcestershire sauce to make a fairly runny paste. Pour this over the cabbage and stir in the ginger, garlic and spring onions. Mix well, using your hands, until all cabbage have been covered. Put the cabbage mixture into glass jars as suitable, leaving a couple of centimeters free at the top. Press down well with your hands to remove all air bubbles and make sure to cover all of the mixture with liquid. Should there not be enough liquid to cover it all - add a bit more water until covered. Screw on the lids and leave the jars at room temperature for a day or so. After that you can keep them in the fridge and use as and when you feel like some Kimchi. I'd give it a week to mature before the first sampling though. Mike, glad to see you back posting! I have only eaten kimchi a few times and have never made it, but this sounds good to me. Might have to give it a try soon so kimchi won't be one of things I only have when dining out.